Uftring Nissan in Peoria, Illinois is proud to announce that they were awarded the Nissan Owners First Award of Excellence for 2013 - the fifth time receiving this honor. The Nissan Owner First Award of Excellence was developed to acknowledge and reward Nissan team members and dealerships who consistently deliver outstanding performance in sales, customer satisfaction, and owner loyalty. The entire team at Uftring Nissan would like to thank you for filling out the Surveys that are sent out by Nissan and returning them with positive feedback. Thank you for choosing Uftring Nissan in Peoria, IL where 100% customer satisfaction is the only goal. The Nissan Owner First Award of Excellence is the highest award presented by Nissan North America to their Dealers. This award recognized Nissan's top Dealers from across the nation who were able to meet the highest standards of achievement. 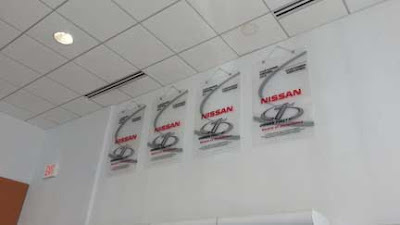 It recognizes those Dealerships that embody the philosophy and vision for the Nissan Owner First Award of Excellence. that is, to endeavor to provide their customers with an outstanding ownership experience, from the showroom through every aspect of the dealership. Basically, putting their owners first. Every Nissan dealership participating is rated based on a variety of criteria including the Nissan's Owner First survey. Surveys are sent out to customers after the purchase of a new Nissan vehicle, or after having a service done on their current vehicle. Customers are Nissan's top priority, which is why Nissan North America uses customers input and feedback to reward those dealerships that meet these high standards. Achieving this honor reinforces Uftring Nissan's ongoing commitment to providing excellent customer satisfaction and is our goal each and every day.